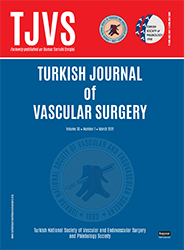 2Fırat University Institute of Health Sciences, Elazığ, Turkey DOI : 10.9739/tjvs.2019.352 Objectives: In this study, we aimed to investigate the effectiveness of methylenetetrahydrofolate reductase (MTHFR) C677T and A1298C gene polymorphisms in acute deep vein thrombosis (DVT). Patients and methods: Between January 2017 and May 2018, a total of 64 patients (37 males, 27 females; mean age 35±18 years; range 19 to 59 years) who were followed with the diagnosis of acute DVT and 64 healthy controls (35 males, 29 females; mean age 43±14 years; range 23 to 57 years) without any vascular pathology were included. The MTHFR C677T and A1298C gene polymorphisms of the samples were identified using the real-time polymerase chain reaction. Results: There was no statistically significant difference in the polymorphisms and allele frequencies of the MTHFR C677T and A1298C genes between the patient and control groups (p>0.05).